No posts in a week and a half! And, frankly, no post worth writing home about today, either, and nothing more until January 4th, 2010. But in the meantime, why not read the second part of Ryan Morrison's dramatized literary history of Japan, and/or my article on "Santa Baby" vs "Koibito wa Santa Claus", over at Néojaponisme? Both in preparation, of course, for the having of a happy new year, and, for those who can shake the illusion of time's arrow, the having had of a mele Kalikimaka. G'night, everybody! Doch an den Fensterscheiben/ Wer malte die Blätter da? I write these words as the Kantō region writhes beneath the boot of a cruel dictator. 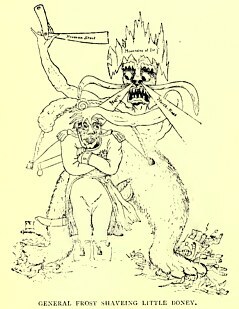 This inhuman master is known only as the Winter Shōgun (fuyu shōgun 冬将軍). The shift from "Frost" to "Winter" is something neither I nor any of the books in the relatively warm parts of my apartment can explain. Chochotakamuneek is a YouTube account up to which its multitalented proprietor "Chocho" is loading self-translated Japanese-language covers of English pop songs and jazz standards. His versions of "Like a Rolling Stone" and "Alone Again, Naturally" are totally boss. There she stood in the doorway/ I heard the mission bell/ And I was thinking to myself,/ "This could be Heaven or this could be Hell"
The lines in the latter still tend to end in what we might gesture terminologically at with a phrase like "feminine moraic rhythm," a sort of trailing-off that contrasts with the tendency in English to end the line hard — but the technique is more impressionistic and the overall effect less cramped. You're fighting for your life inside a — killer — thriller — tonight! Inochi o kakete tatakau yori — hoka nai — abunai — tunaito! She loves you/ Yeah, yeah, yeah! Kanojo wa/ Omae ga suki! Drink a cat. Meaning unknown. 1781, Yanagi-daru XVI: "Sudden well-cleaning/ The whole tenement/ Drinks cat." "Cat" (neko) = "Geisha." Because geisha play shamisen, and the resonatey part of a shamisen is made by stretching catskin over a wooden frame. "Cat poop" (nekobaba) = "Hidden [and usually ill-gotten] assets." Probably originally referred to literally burying stolen money and goods to keep them safe and hidden, but nowadays refers more often to white-collar theft: embezzling, tax avoidance, etc. Note that Everything2's claim that baba actually means "old woman" here is unnecessary madness. Baba is baby talk for feces, cats bury feces, apply Occam's razor to taste. 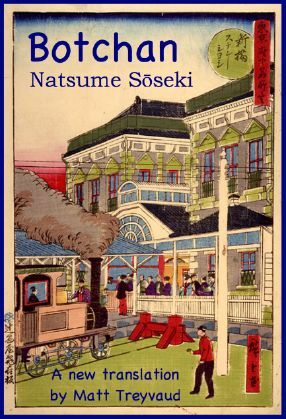 As the title suggests, while I don't mean to intrude, I really think that you should buy the updated, improved edition of my translation of Natsume Sōseki's Botchan in e-book form. The Kindle version is out now, and others should follow soon. And there's a sample chapter up at the revamped Botchan page and everything. In preparing this edition, I walked the line between sanding down the rougher, oh-yeah-I-did-this-in-a-hurry edges and retaining the profane, rollicking atmosphere which is the whole point of my translation in the first place. But don't worry: when in doubt, I came down on the side of profanity and slapstick. Within this book — nay, this translation of this book — lies the entire story of imported teachers in Japan: a century of culture clashes condensed into eleven unsentimental, dry, and hilarious chapters. If you have a Kindle, you know what to do. Thanks!